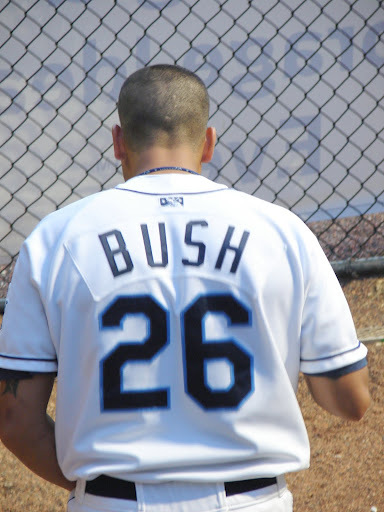 WFLA-8 Tampa is reporting this morning that Rays minor league pitcher Matt Bush was arrested yesterday on several charges stemming from a DUI accident in Port Charlotte. Bush is accused of striking a motorcycle on US-41 in Port Charlotte and then leaving the scene of the accident. The motorcyclist was flown to Lee Memorial where he is in serious condition. Bush was later captured in North Port and charged with leaving the scene of an accident with serious injuries, driving with a suspended license, DUI with serious injury and DUI with property damage. These are the initial charges which are subject to change as additional evidence is obtained. They could be reduced, enhanced, dismissed, or new charges could be filed after further investigation. The condition of the victim is the most obvious factor which could lead to additional charges. The initial appearance to determine who will represent him and other preliminary matters was scheduled for this morning but has been continued to Saturday, March 24th, at 8:30 am. His arraignment is scheduled for May 21st at 9:00 am. He will remain in jail without bond at least until the initial appearance tomorrow morning. A bond amount could be set at that hearing. Sad development for a guy who seemed to have turned his life around and was finally on the path to the Big Leagues. Hopefully for his sake the guy ends up okay. I agree with Nick. I was so proud of Matt and all he's accomplished these past few years. I am so upset right now and hope the motorcyclist heals completely. I feel for the victim, his family, Matt Bush and his family. Several lives were ruined yesterday. I was hoping Matt would be able to overcome that disease, and it looked like he was on the right track. This should serve as a lesson to all, especially young ball players who can easily get caught up in the down time this career can bring. I'm praying for the best outcome for all involved!!! HaHaHa first off this kid never turned his life around always has been messed up I know first hand! This is Karma dude! @Anonymous 05:15-Do you even know him? I do and your attitude is just plain cruel. This obviously isnt the first time it has happened and he still hasnt learned his lesson. Hopefully he gets hit hard this time. I think baseball should be the last thing on his mind and recovery and health should be first. I hope the driver is ok.. Its sad that someone else has to be the victim of his problems he is going through. I agree the comment above was cruel.. but its true.. he never really was ok.. Everyone wanted to believe he was.. but this was bound to happen with the decisions he was making. He needs serious help and i hope he and the rays relize this. Hopefully everyone will do the right thing here.